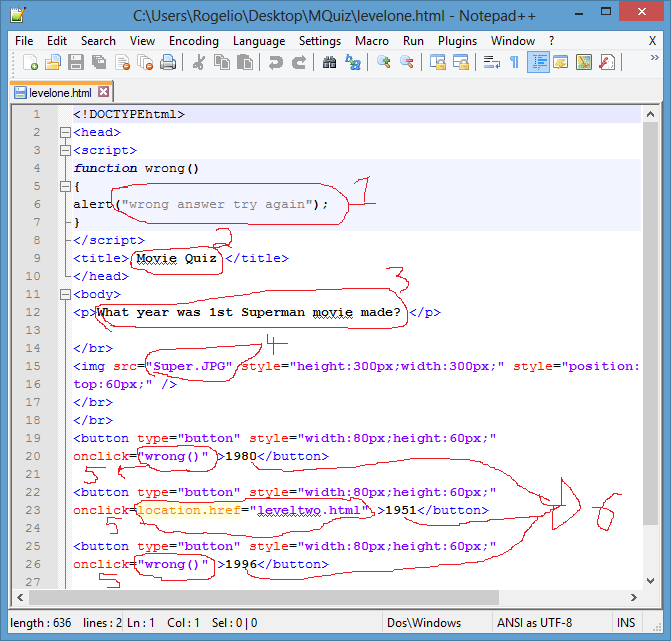 HTML5 POP QUIZ FRAMEWORK : You can easily edit and make your own pop quiz game w/ instructions. named and that will show in broswer tab or mobile device in bar along top of screen. tags to whatever question you would like the player to answer. 5)These are the onscreen buttons that the player will click. onclick="wrong()" that means if the player clicks this the answer is wrong and a pop-up box will appear. onclick=location.href="leveltwo.html" means the player got the answer right and can move to next page. So you can choose which selection you want to have right or wrong and type in the correct value. it and place it in another folder. onclick=location.href="leveltwo.html" change that to "levelthree.html . and place it in another folder. Now you have 2 levels. and make some super games!! So how to chec if user put a or be ? I assume all the styles can be put in one style.css that is linked to in the <head> of each level html file, eh? Thanks for the explanation, pixelpower. Makes it very easy to understand. Your welcome indieee I look forward to seeing your apps!! Hey there - I have a related question re how to keep a count (e.g. score) between the html files. I asked support and they said to post it on the forum, which I did here but surprisingly no one is answering. Maybe you have the answer as you might have solved it with your quiz framework? I haven't been in the forums since I took a break from it. I never used local storage so I don't have an answer . If I get the chance I will look it up and see how it works. So maybe I need to do this all in one html file?